Thanks to Snapshotters Jihang and parsfan who posted it to Talk, we can all marvel over the best ever picture of a black rhinoceros taken by a Snapshot Serengeti camera. There’s no mistaking this beast! There are two types of rhinoceroses in Africa: the white rhino and the black rhino. Despite their names, they’re both gray, but you can tell them apart by their lips: white rhinos have broad lips, while black rhinos have a pointed and curved upper lip that is used to grasp vegetation. There are only black rhinos in the Serengeti (and in all of Tanzania), and they can grow to weigh up to 3,000 lbs (1,360 kg). Despite their size and bulk, these animals can really move — at speeds up to 28 mph (50 kph). Several years ago, I had the chance to see the rhinoceros rehabilitation center at Kruger National Park in South Africa. This gave me a chance to get fairly close to the creatures. At one point I was on the other side of a fence from a rhino and it charged me; the fence was made of wood and very solid, so I was fine and the rhino just bounced off the fence. But I was amazed at how fast it went from standing still to ramming speed — and how quiet it was doing so. Black rhinos are critically endangered, with fewer than 5,000 alive in the wild (as of the end of 2010, the most recent statistic). Fully 95% of all wild black rhinos live in one of four countries: South Africa, Namibia, Kenya, and Zimbabwe. Tanzania has only about 100 of them, with a quarter of those in the Serengeti. It’s thought that about 1,000 rhinos originally inhabited the Serengeti. But in the 1970’s and early 1980’s, poaching increased severely. A park survey conducted in 1982 found only two remaining rhinos, both female. Efforts were made to actively protect these remaining two, and plans began to be made to bring in a male. But before those plans came through, a male rhino showed up on his own in 1994. It’s thought that he came from the Ngorongoro population, which contained only about a dozen animals at the time. Moreover, it was quite a hike at 70 miles (113 km). As I said, these animals can move! It’s something of a mystery how this male rhino found the females in so vast an area — sound? smell? — but he stayed. Within a short time there were four babies, and since then, the population has steadily grown. Now there are twenty or so black rhinoceroses living around Moru Kopjes. These Kopjes are about 20 miles (32 km) south of our camera trap area, so we only rarely catch a glimpse of one (out for a walk?). While the Moru population is growing, it still faces two major threats. The first is continued poaching. Demand for rhino horn has been rapidly escalating since 2009, with black market prices in Asia skyrocketing, and organized crime getting into the action. 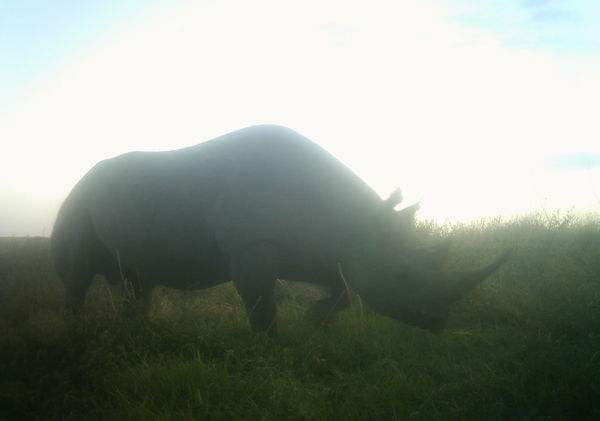 In May 2012, two of the Moru rhinos were found dead with their horns missing. The second threat to the Moru population is inbreeding, which over time can cause lower reproduction rates and increased genetic disease. Fortunately, there are ongoing efforts to both protect the existing rhinos and to bring more black rhino genetic diversity to the Serengeti by translocating animals from South Africa. Perhaps in several decades these massive beasts will once again make regular appearances in central Serengeti; until then, keep your eyes peeled for their rare cameos. Thanks for this informative post. Africa is my favorite place in the world to travel to and I am forever grateful to people like you who continue to protect the rhinos from vicious poachers.